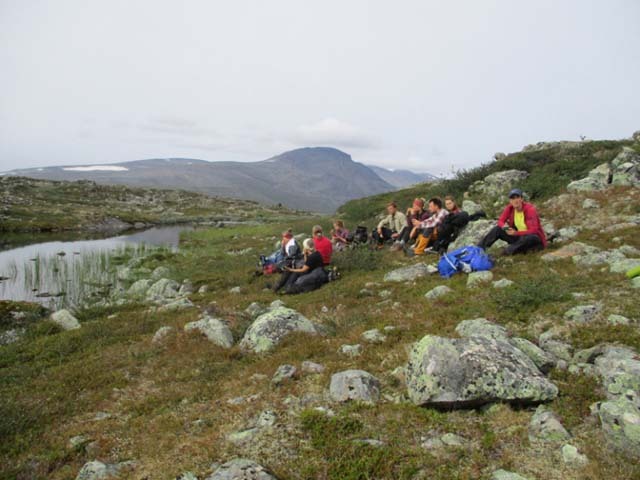 Discover Mountain Hiking on the King’s Trail is a guided tour in Swedish Lapland and is an introduction to multi-day trekking on Sweden’s most famous hiking trail. 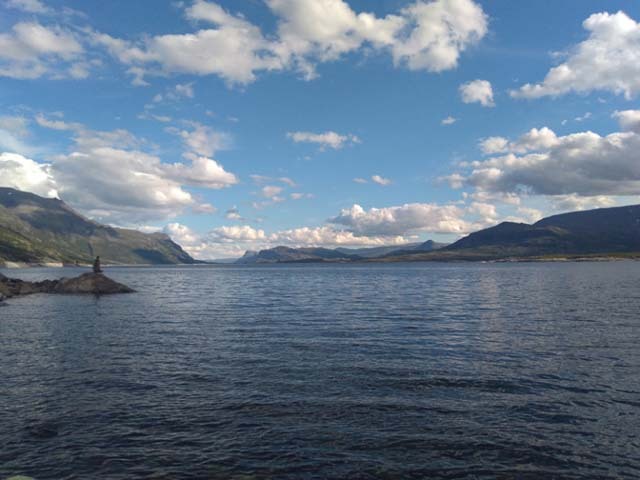 Niki from the Nature Travels team joined a High Summer tour in August 2018 and tells us a bit about her trip. I’ve been to Sweden a number of times but this was to be my first experience using the night train to travel north for my adventure. You can take the train directly from Stockholm Arlanda airport to travel to Gällivare (or on to Kiruna if you were to travel to one of our dogsled tours in the area). After a very early start that morning, I was grateful for the tip from my colleague to book the top bunk so I could go to bed early as the top bunk is already in place. The simple couchette carriages have 6 beds, with the seats turning into the bottom and middle bunks. With a bit of teamwork and the handy instructions we figured out how to turn the carriage into a sleeping carriage. All kinds of weather bring something to the experience of hiking in the mountains. Photo: Niki Bates Nature Travels. After my night’s sleep on the train, I hopped off at Gällivare, took the bus to Kebnats and after a short walk over to the boat I travelled to my first night’s accommodation at Saltoluokta. I had easily found the rest of my group for the week and as we were to meet our guide in the afternoon we had a few hours to enjoy our surroundings and decided to have the buffet lunch once the delicious smells from the kitchen had travelled to tempt everyone nearby. Once we had checked into our rooms, we met our guide, Rolande, who took us through the plans for the week before we had dinner. Too cold for a swim, but beautiful to look at! Photo: Niki Bates Nature Travels. 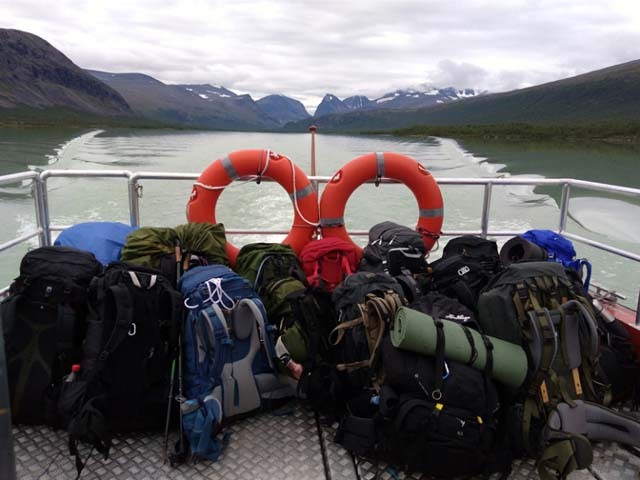 Our first day was spent on a day hike in the beautiful surrounding area of Saltoluokta to test out our gear and make sure we were comfortable with our packs, with a stop for lunch by a river. We were then to take the bus to our next stop at Vakkotavare. Our guide had split us into 3 groups to carry out chores around the cabins each day – one to do the cooking, another to do the washing up and the other to fetch water, chop wood if needed and get rid of washing up water – so we split into our groups and luckily I was on water duty so after we had made sure those making dinner had enough we went for a chilly dip in the lake. The beautiful Lapland mountains. Photo: Niki Bates Nature Travels. Our journey began the next day by hiking steeply up a hill for the first part but once up at the top the trail levelled out. 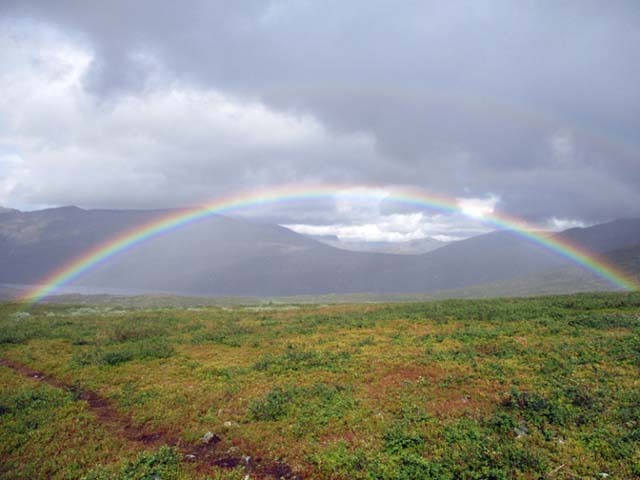 Normally you would be rewarded with views over Sarek National Park, but today we were appreciating our waterproofs so sadly there was no such view but you can’t get rainbows without a little rain and towards the end of the day we were treated with a full rainbow as we had started to make our way down to meet the boat that would take us to our next cabin at Teusajaure. Over dinner each evening, we chatted about the day and learnt what we were to expect tomorrow – tonight we got out our maps and compasses and talked through how to use them, which we would put into practice in the morning. Time for a sit down! Photo: Niki Bates Nature Travels. Pho Today’s hiking started with another steep hill – Vakkotavare and Teusajuare cabins are having a competition as to who has the hardest hill behind them. We took both at a steady pace so whilst you had to use a bit of effort to get to the top ,it’s nice to get the hills out of the way at the beginning of the day! Today’s distance wasn’t particularly long but this allowed time for using the compass skills we had learnt the evening before to find the perfect spot for “fika”. Fika is Swedish for a coffee break that normally involves a little something sweet to eat and Rolande always had a pack of biscuits to hand! 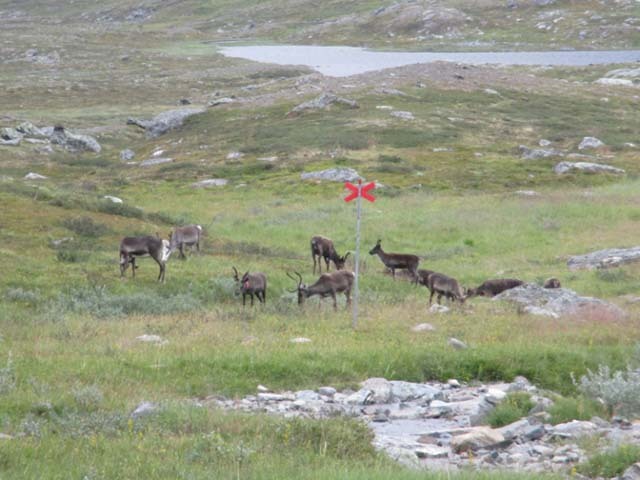 Reindeer can often be seen in the Swedish mountains at this time of year. Photo: Niki Bates Nature Travels. After we had a quick rest and a refuel, we separated and wandered out in search of reindeer antlers. After enjoying the peace and taking in our beautiful surroundings whilst keeping an eye on the ground, we gathered back together to show off our findings! After strapping our antlers to our packs, we carried on along the river to Kaitumjaure cabin. This afternoon there was time for brave souls to take a dip in the glacier “bubble bath” before heading over to the sauna to warm up before dinner. The ever-useful Buff! Photo: Niki Bates Nature Travels. 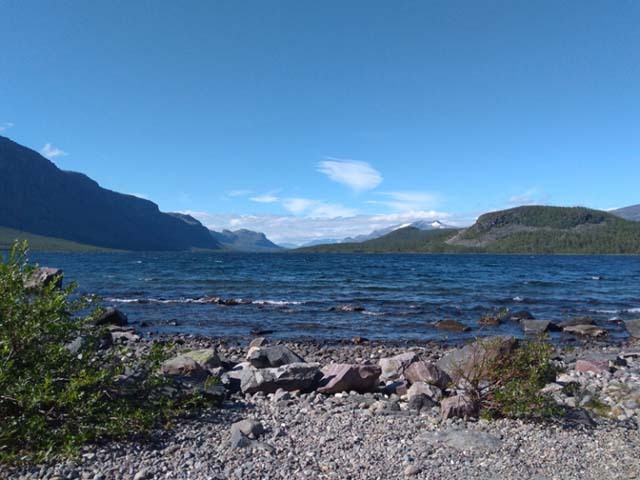 The following day would take us along Tjäktjajåkka river, leading us nearer and nearer to the large mountains of the area giving superb views as we headed to Singi cabins. 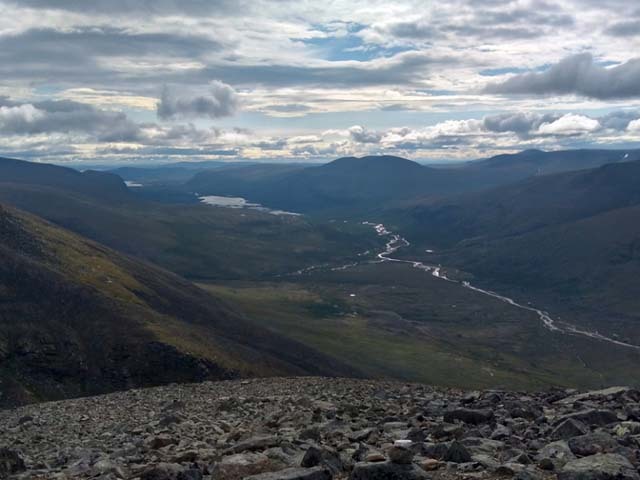 From Singi, we walked through the valley heading to Kebnekaise. A dry but cloudy start meant that throughout the day the landscape changed as the clouds moved to show another hidden peak, giving a mystical feel. The wind had picked up and we decided to search for an alternative to our originally-intended fika spot to look for a little more shelter. 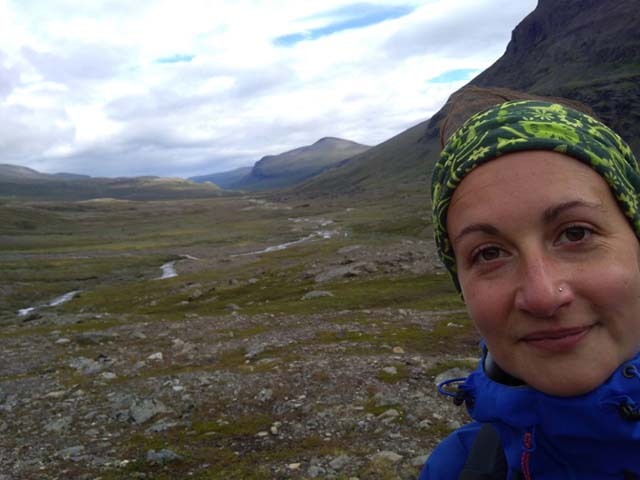 Rolande found us the perfect place and ran back to gather us as quickly and quietly as possible as a herd of reindeer wree grazing at the bottom of a hill, so we enjoyed our coffee after ticking another box off the Swedish Lapland list of things you wish to witness during your visit! Beautiful views of the surrounding wilderness. Photo: Niki Bates Nature Travels. With Kebnekaise hiding under a cloud on our left, the view of the valley opened up into a magnificent vista and my favourite view of the tour! Kebnekaise mountain station was a welcome sight, as we knew there would be hot showers and a 3-course dinner waiting for us at our goal at the end of the day. That evening, people doing the summit tour attended a meeting outlining the day, what to bring and collect the equipment you would be using that day. The following day the majority hiked to visit a local research station but I excitedly decided to attempt the summit with a few others in my group – but I sadly couldn’t keep up with the pace that was required to reach the summit safely in time so I made my way back down to enjoy a peaceful afternoon instead. After another scrumptious 3-course dinner, we all headed to bed for an early start. Taking one of the boats across the lake. Photo: Niki Bates Nature Travels. To make it to the first boat, we headed out early at a good speed to catch the first boat over Lake Ladtjojaure so we had a more relaxing walk through the forest from there to Nikkaluokta. After reaching our final destination, we picked up any belongings we had sent from the start (I had luckily sent a set of clean clothes, as I had managed to break both pairs of trousers I had brought along for the tour), sat down for lunch and discussed our favourite bits of the tour and for some their new-found love of hiking! Hiking mission accomplished! Photo: Anette Polsk. Most of the group were taking the night train home, so it wasn’t a sad farewell as we were to hang out for a little while longer – it did however, turn out to be rather a lot longer due to delays but that’s all part of the adventure! 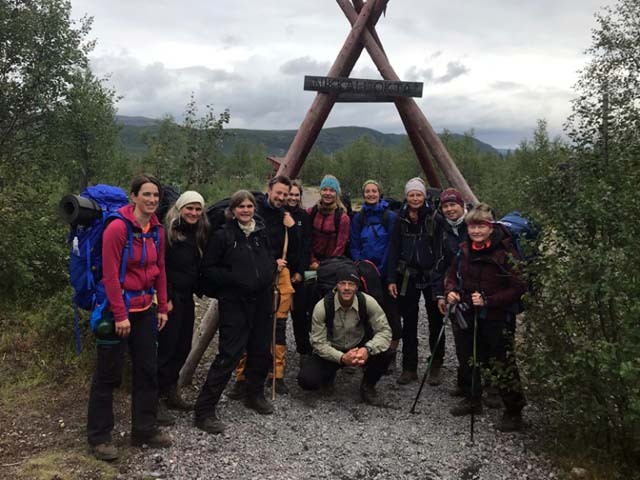 In addition to the Discover tour, Hiking on the King’s Trail from Abisko to Kebnekaise has a higher level of challenge and runs on a slightly different route. 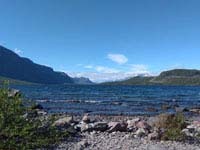 We also offer Self-guided Hiking on the King’s Trail.